So, you’ve decided to build a website to support your freelancing business. Maybe it’s because someone more experienced told you that you needed a site, or maybe you wanted a more professional space to showcase your work than a social media page. Whatever the reason — great! You’re well on your way to being found by your clients. Now, at some point during all that researching and site building, you probably heard the term “SEO.” That acronym may seem super mysterious and even a little intimidating if you don’t understand it. It’s okay, I felt that way, too. Let’s take a little closer look at what defines SEO, and why it’s so critical to your freelance business. SEO stands for Search Engine Optimization. Nearly every user on the internet uses search engines to find and access sites around the web. You can think of a search engine as a research librarian — they both analyze requests, organize relevant materials, and refer you to the sources they think best answer your query. Search engines crawl, index, and reference most of the material on the internet. That means that they use a software program that navigates the web using links, taking inventory of the information it finds along the way. That information is then indexed for the next time a user submits a relevant query. 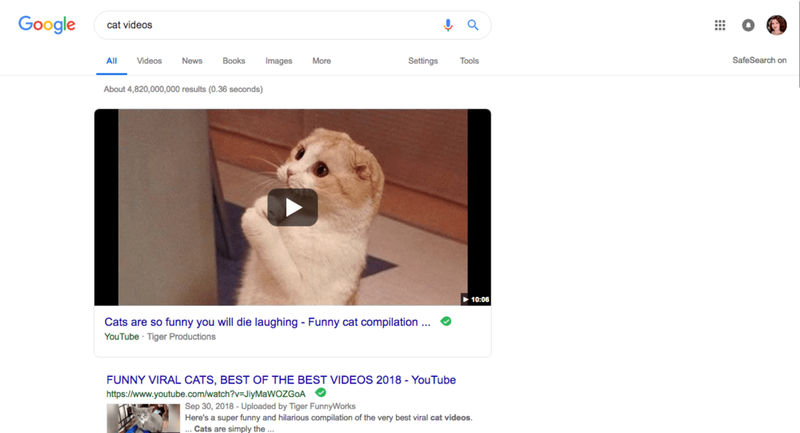 Queries can be short (called “fathead search keywords”), such as “cat videos.” They can also be long (called “longtail search keywords”), like “Why won’t my cat play with her toys anymore?” Generally, the longer a search term is, the more specific a web page has to be to be shown in the search results. Search Engine Optimization is the art and science helping websites show up in searches. When users search, they are shown a Search Engine Results Page (SERP), which is a ranked list of sites that are relevant to the search terms, stacked from the most relevant to the least relevant. Obviously, you want your site to show up towards the top of that list, which is why you’re here now, reading about what you can do to make that happen. Why Does SEO Matter for My Business? I presume that you wouldn’t be searching for ways to make your site perform better unless you’ve realized that you’re not getting the traffic and interactions you want. The internet is filled with millions of freelancers, small businesses, corporations, franchises, and more, all vying for users’ attention. What sets your site apart from the rest in the eyes of a search engine? Spoiler alert: it’s SEO! SEO is a free way to make your site — and by extension, your business — visible to people looking for you. You can, of course, hire SEO specialists whose job it is to stay on the latest trends and make sure that your site is ranking the best it can. But the good news is, you can learn to do SEO yourself. In fact, many SEO specialists started off as self-taught. So, to make a long story short, SEO is a free method to help your clients find you and ensure that your website starts paying for itself. Now that you understand just how important it is to take charge of optimizing your website, you may be wondering just what to do. SEO is a complex, highly nuanced field and can seem daunting, but every site starts somewhere. Here are three steps that you can do today that will help kickstart your SEO journey and help your site start climbing the ranks on your potential client’s searches. I can hear your groans from here. “But I’m a creative person,” you say, “I don’t get data.” I know, I know. Bear with me. While this is coming from a creative worker with a knack for data, I can promise you it’s super easy. Analytics programs, like Google Search Console and Squarespace’s built-in analytics page, contain a lot of useful information. They detail your site’s visitors, your popular content, where your site is showing up in searches, and other handy data that can help you understand your site’s traffic. This is also a necessary tool later on when you start experimenting with what works to boost your rankings and what doesn’t. Here’s what Search Console looks like for my site, which includes my mid-January site overhaul. We’ve got a ways to go! If you have a Squarespace site (like mine), you’re already connected to Squarespace’s in-house analytics program. I decided to take it one step further and also connect Google Search Console to my site. Squarespace makes it easy to do under connected accounts, which they explain in this tutorial. If you use another hosting option, such as a WordPress site, you can use your Google account to log in to Search Console and verify your ownership of the site. MonsterInsights lays out just how to do that in this post. Google Search Console is going to be your new best friend as a budding SEO manager. It provides so much information, makes it simple to submit site changes to Google, and can help you start generating your handy-dandy SEO strategy, which I’m going to cover in my next post. “My what? !” you cry. I know–setting up your analytics program may have been a bit harrowing, depending on your particular tech savviness and patience levels (confession: I cried trying to link my first freelance client’s WordPress site to Search Console. ), but we’re not done yet. Metadata is actually really simple. Let’s go take a quick look back at our SERP again, and you’ll see. Check out the image below. This is metadata. The large blue text is the page title, which as you can see has the topic of the page and the site title included. Good on you, Practical Ecommerce. This is a good way to start when writing metadata, since you can include your brand (and any influence you have), as well as your page’s overall topic. Below that, we see a URL in green and a description in dark grey. You can see that the key terms of my search, “metadata search engine,” are bolded in the description. Unfortunately, this description is a little long, which means that Google automatically truncated it. Oops! This is an important lesson. Metadata lengths change from time to time, but generally, shorter is better. Google will display 600 pixels of a title (something like 55–60 characters, including spaces, at the maximum), and about 155 characters of a description. Depending on the device being used to view the SERP, these numbers may be even less. This is a place where less really is more! Here’s a handy tool from Spotibo to help you write metadata that meets Google’s standards: Google Search Results Preview Tool. Now, you may or may not have already written metadata for your site. In Squarespace, the metadata for each page is really simple to access, since it has a built-in tool under your page settings. WordPress sites, however, need a little extra help from a plugin. Personally, I use the Yoast SEO plugin on WordPress sites that I manage. It works well for me, and it’s pretty simple. 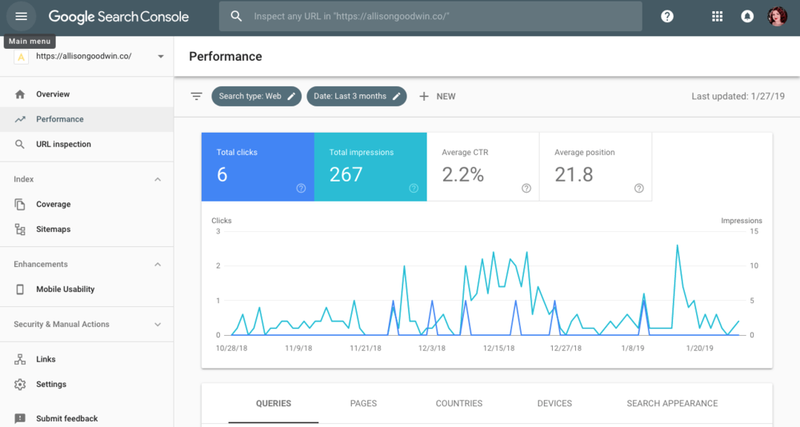 It can help you connect your site to Google Search Console, which is a big win in my book. At the bottom of the post or page editor, it’ll provide you with the settings to write your own metadata, which they call “snippets.” Yoast SEO even can help keep you on track by giving you help with length, content readability, and keyword usage. 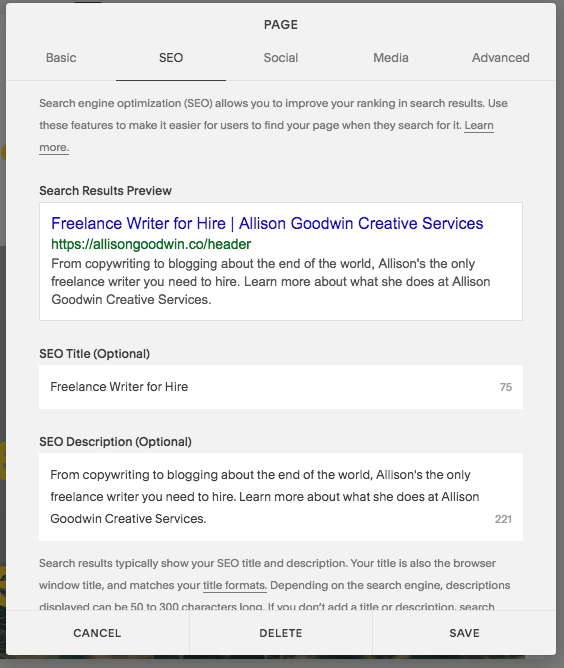 Left, Squarespace’s built-in SEO settings that help you publish metadata for each page. Right, Yoast SEO’s plugin for WordPress sites provides metadata publishing and more functions. Since you can find your metadata now, you can leverage it to boost your rankings. Crafting thoughtful, short, and optimized metadata can take some skill. Shameless plug here, but it’s a service I offer, just in case you still want some help. Knowing which keywords you want to target makes it much, much easier. If you aren’t sure just yet, that’s okay. Pick some that seem likely, and we can talk about it more in an upcoming post. Oh no, more techie stuff? This is the last task you have for today, I promise. Your XML sitemap is a document that is used by search engines to understand how to effectively navigate your site. It’s the difference between trusting bots to wander around your site and telling the bots exactly what your site looks like and what they need to index. Your site can be indexed without a sitemap, but it’s a handy way to alert Google to your site and help it be indexed more efficiently. Sitemaps aren’t much to look at. Here’s some of mine from my site, allisongoodwin.co. Screencap of a sitemap from allisongoodwin.co. The good news is, if you’ve gotten Search Console all set up, it’s really simple to submit your sitemap and check one last thing off your list. You’ll need to generate your sitemap first. For WordPress sites, Yoast SEO can do this. Under the “Features” tab for Yoast, you’ll get a list of options. Make sure the setting for XML sitemaps is toggled on, and click the question mark next to the option for a link to view your site map. If you’re a Squarespace user, the map is automatically generated for you — all you need to do is type /sitemap.xml at the end of your domain. You can also use a sitemap generator, like XML-Sitemaps.com. Yoast SEO features from a WordPress site using the plugin. Now, head over to Google Search Console. On the sidebar, you should see an option called “Sitemaps.” That will take you to a page where you can submit a new sitemap. Since Google already knows your domain, all you have to do is put the right sitemap URL on the end. You can see here that, for my site, it’s simply /sitemap.xml. WordPress sites tend to use /sitemap_index.xml. Whatever is provided, type or paste it in, and click submit. Submitting a sitemap to Google Search Console. You’re done! How’s it feel to know you’ve taken the first steps in learning to manage your site’s SEO? There’s still lots more to learn, but we’ll be exploring SEO together, step by step. Is there an SEO topic you want to know more about? Let me know in the comments! All screencaps were taken by the author.